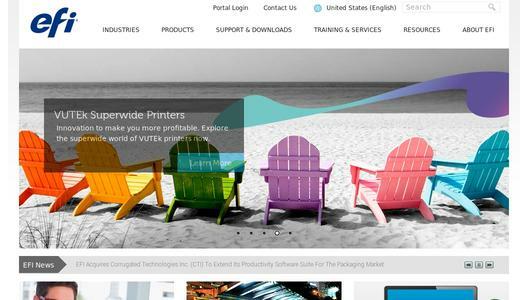 EFI™ (Nasdaq:EFII) today reported that Cheadle, U.K.-based Cestrian Imaging Ltd is one of the first companies worldwide to have invested in the EFI VUTEk®HSr Pro, a dedicated roll-to-roll inkjet press - part of a dual-press purchase that also included an EFI VUTEk HS100 Pro hybrid roll/flatbed press. The company chose the EFI presses because of their robust production capabilities; the presses' precise ink lay-down enables production-quality imaging at full-rated speeds - a unique advantage of their highly consistent, reliable ink adhesion on a wide range of substrates. "At Cestrian we pride ourselves on developing and processing materials which provide our customers with the best solution for their requirements, including those products that have high environmental credentials. However, our innovative approach to product development is not without its challenges, with some materials providing print instability and ink adhesion issues, for example. The EFI VUTEk presses give us the flexibility to process these materials with a low amount of waste, offering high quality at a competitive speed," said Paul Gibson, Cestrian's Production Director. Cestrian, a business that services customers all over the world, has invested over 2 million GBP in the latest printing technology over the past three years. The added capacity fits with the company's extensive facility, which includes a large range of sheetfed and hybrid inkjet printing equipment, cut-sheet digital presses, fabrics and textile printers, trimmers and cutting machines as well as welders. The company, which is renowned for delivering high-quality, timely results for its clients' outdoor graphics and poster printing needs, has 20 years of experience in the outdoor advertising market and has built proprietary software to streamline the entire process with online bookings, proofing and approvals. The EFI VUTEk presses meet Cestrian's high standards with multiple running speeds and print quality settings that give the company the ability to quickly process standard out-of-home graphics, as well as high-end backlit display prints. One of the first companies in the UK to offer inkjet billboard printing, Cestrian today can also wrap an entire building, transforming any given urban landscape with dramatic advertising images. For these large-scale applications, the new VUTEk roll-to-roll press helps the company raise its productivity and image quality levels. The press handles flexible substrates up to 126.5 inches (3.2 m) wide, has an elevated unwinder and rewinder system and multiple-roll capability with two 60-inch (152-cm) rolls. EFI 3M™ SuperFlex ink available for the press is ideal for outdoor graphics applications and has solvent-like elongation characteristics and withstands heat installation without cracking. Operating at speeds up to 100 boards per hour, the EFI VUTEk HS100 Pro press represents a true alternative to analogue equipment, offering throughput comparable to screen printing, with print quality that approaches offset on a wide range of flatbed or roll-to-roll print jobs. The press includes fully automated loading and unloading to accessories for more-efficient production of one-off jobs to longer-run work traditionally suited for screen printing or offset presses. Both of Cestrian's new EFI VUTEk investments feature EFI's Pin & Cure imaging technology, which offers precise ink lay-down, gloss control and greater imaging accuracy. Plus, the presses provide true, variable-drop greyscale imaging for higher image quality and accurate spot-colour matching. Highly opaque white ink and a unique, multilayer printing capability on the presses ensure high-end visual appeal on backlit displays and other applications. Cestrian uses the latest-version EFI Fiery®proServer technology to reduce RIPing times while ensuring consistent, high-quality imaging on its EFI VUTEk presses. The company also is a long-time user of EFI DirectSmile™ software, which Cestrian uses to develop personalized marketing materials and help multi-channel direct marketing clients synchronize print, URLs, email and SMS whilst tracking response rates. Employing over 80 people, Cestrian's aim is to bring brand communications to life, from design to production. The company is an industry leader in PVC banner and textile printing for retail point-of-sale signage and the diversity of Cestrian's state-of-the-art equipment - including the new inkjet press pair - enables the company to deliver successful projects, no matter the complexity or scale. "Overall, the EFI VUTEk presses give us greater flexibility with higher quality imaging and faster production speed than other inkjet presses," Gibson said. "We've been impressed with their precise ink lay-down and their ability to use variable-dot greyscale imaging. They help us maintain the high level of standards our customers expect." For more information about advanced superwide-format print technologies from EFI, visit www.efi.com.